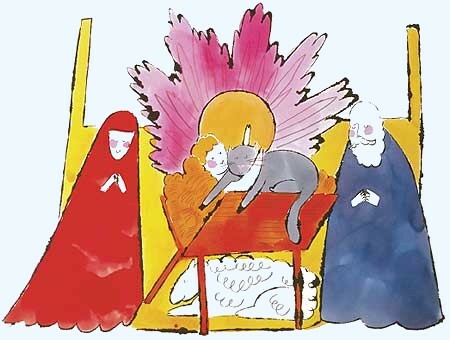 On its 17 December 2005 cover, The Tablet features Andy Warhol’s delightful Nativity.
. . . Warhol’s Nativity lacks the ambiguity of his later works, and yet there is vulnerability as well as childlike joy in the painting. It is an image which evokes the innocence of the infant Christ, and of the Incarnation itself. . . . Unlike many great works of art, this is a Nativity which is not yet overshadowed by the Cross. For a moment, it invites the adult viewer to set aside the knowledge of what is to come, and to enter into that child’s world where the present can be fully present, and joy can be a vivid illumination of the world around us. … all art is to some extent a misrepresentation of the event. Indeed, the less authentic an image tries to be, the more it might remind us that no work of art can capture the birth of Christ, and the more it appeals to our aesthetic sensibilities, the less likely it is to give us a glimpse of the human reality. … Only those who had ears to hear and eyes to see would have heard the angels’ song and recognised the God of all Creation in the crumpled newborn baby before them. It is still so today. The incarnation shimmers just beneath the surface of all that is, but it does not intrude upon us or force us to acknowledge Christ’s grace in the world.
. . . Warhol was an enigmatic person, an intensly religious man behind his celebrity façade. Born in Pittsburgh in 1928 to Slovak immigrant parents, he remained a devout Catholic throughout his life, attending Mass several times a week and serving in a soup kitchen for the homeless. His father, a stonemason, died when he was 13, and his mother lived with him from 1959 until her death in 1972. Like many modern believers, his life was a complex anagram – more complex than most perhaps – of private faith and public façade, in a celebrity culture that tolerates faith only when it comes clad in the fashionable esotericism of the moment. The Guardian once described Warhol as a Catholic mystic, and his last works were a series of paintings based on Leonardo da Vinci’s Last Supper.
. . . At a time when the word “hate” seems to occur much more often than the word “love” in discussions of religion, perhaps we can permit ourselves a moment of light-hearted respite, of thankfulness, of childlike delight that Christ has indeed been born among us. Like that fat, contented cat, we too might find a moment’s respite in Christ’s arms, away from the frenzy of the Christmas rush. Perhaps, in spite of itself, Warhol’s Nativity can take us behind the surface, to the vulnerability of love that is forever beckoning to us, beyond the painted faces and mass-produced images of our consumerist world. The Guggenheim’s press release for its 1999 exhibition of Warhol’s Last Supper series said “Warhol considered the project crucially important to his life and work.” adding that “Although it is not widely known, Warhol was raised and remained a devout Catholic during his life.” However, reviewer Anthony Haden-Guest was sceptical of the effect of religion on the The Last Supper series. It received little mention in Warhol’s voluminous diaries. 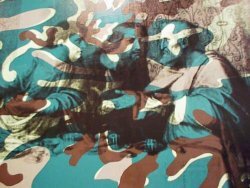 Emeritis Professor Jane Daggett Dillenberger, of the Graduate Theological Union of Berkeley, discovered more than 100 Warhol drawings and paintings based on Leonardo da Vinci’s Last Supper and published The religious works of Andy Warhol (Continuum, 1998), reviewed here..